The Monarch Crest starts on the east side of Monarch Pass. This is the drop-off point for shuttle vehicles. Ride up the dirt road behind the tram building and climb a bit before finding the start of the Monarch Crest Trail on the right. The route begins relatively flat and contours through pines. The tread is fairly smooth with a few roots. After a quick climb on a section of doubletrack, stay right again on singletrack. This segment is a big more technical with roots and a few rocks. From here the trail is fairly open has spectacular views of valleys and mountains to the west. Stay right (straight) at intersections with Fooses Creek (access to Colorado Trail), Greene's Creek Little Cochetopa. 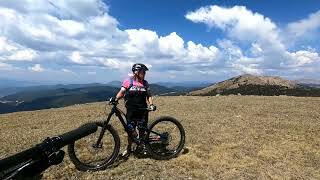 Chipeta Peak looms large and beautiful to the east as you pedal up a short steady climb from Greene's Creek. Above Marshall Pass, the route opens up into doubletrack and descends quickly. Ride past the pit toilet continuing south. When the road bends right, pedal straigh up the hill and then to the right. Look for Monarch Pass trail on the left. The route contours again with some short climbs and descents. Most of the time you'll be in the trees with a tread surface that alternates between smooth and rooty. The Silver Creek Trail intersection will sneak up on you quickly after breaking out into the trees on a quick downhill. Turn left here for Silver Creek Trail and the Monarch Crest - IMBA Epic. One of the best high alpine rides I've done. Great scenery! Beautiful blue bird day, higher traffic from the day before but well worth it to get to Greens Creek! Late October on the Monarch Crest. Such a peaceful setting to ride through. There's snow in them hills! At tree line on the 'Crest. High alpine singletrack at its finest. Great views on the 'Crest. Rolling along Monarch Crest Trail. Sweeping vistas and often threatening skies. Colorado Trail on an October evening. One of the many beautiful views. 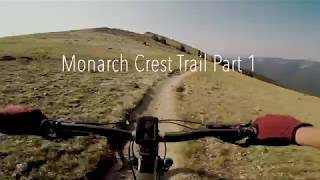 The first part to our trip on the Monarch Crest. View from Monarch Crest Trail! Fast & flowy through the trees. Looking down onto Silver Creek from the CT.
Top of Fooses before a really fun descent!